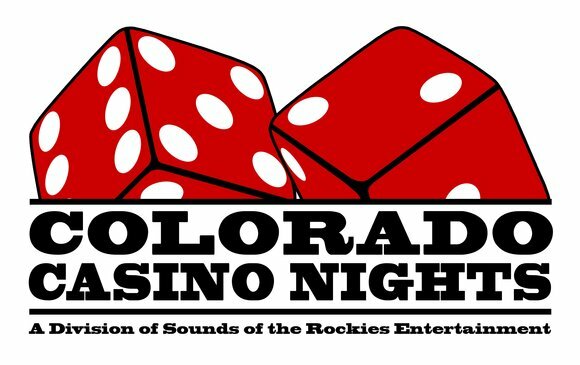 Colorado Casino Nights offers full size, high quality, Casino regulation CRAPS Dice tables! Craps is a fun, popular, high energy game that anybody can get involved with. Guests love to play this game, especially when they don't lose real money, to learn how the game is played. Our dealers are trained to teach the basics and the advanced play to everyone who wants to learn so even if it's your first time, it probably won't be your last! In Craps, players wager money against the casino on the outcome of one roll, or of a series of rolls of two dice. Craps can also be played in less formal settings and is said to be popular among soldiers. In such situations side bets are more frequent, with one or several participants covering or "fading" bets against the dice. 10' & 12' Tables comes with standard Vegas felt layout. These are furniture grade Craps tables made by the same manufacturers as some of the Vegas hotel casinos! A 10' Craps Table holds up to 14 players. A 12' Craps Table holds up to 20 players. These tables are BEAUTIFUL and make a great decor piece as well as the HOT SPOT of the evening! This is the most common game we teach - without your guests loosing a dime! Also, check out our LED Craps Table with 2 colors of your choice available! Craps is a game played by 1 or more players. Players take turns rolling two dice. The player rolling the dice is called the "shooter". The game is played in rounds, with the first roll of a new round called the "come-out roll." On the come-out roll if the total of the two dice are 7, 11, 2, 3 or 12, the round ends immediately and the shooter must roll another come-out roll. A result of 2, 3 or 12 is called 'craps' while a result of 7 or 11 is called a 'win' or a 'natural'. When any other number (4, 5, 6, 8, 9, or 10) is rolled on the come-out roll, this number becomes what is called the point. If a point is established then the shooter will re-roll the dice continuously until either a 7 is rolled, or the point is rolled again. If the shooter rolls the point again, the round ends and the game starts over with the same shooter rolling another come-out roll. If the shooter rolls a 7 instead of the point, this is called a 'seven-out', the round ends and the dice pass to the next player to the left, who becomes the new shooter. Players can make any of a large number of bets. Most of these are betting on the way the round will end (point comes or a seven out). Other betting can include betting on a specific total being rolled, or a specific total being rolled before a 7. In a casino players will make bets with chips on a specially made craps table. A new shooter, who must bet the table minimum on either the pass line or the don't pass line to play, is presented five dice by the stickman and picks two. The dealers will usually insist that the shooter roll with one hand and that the dice bounce off the wall surrounding the table. These requirements are meant to prevent cheating attempts by players switching the dice or making a "controlled shot." If a die leaves the table, the shooter will usually be asked to select another die from the remaining three but can request using the same die if it passes the boxman's inspection. This requirement is used in an effort to reduce cheating the game by players substituting loaded dice for the regulation dice. In Atlantic City, a 3-6 is also called a "Centerfield Nine". A 4-5 is called a "Railroad Nine". Fire Bet: Before the shooter begins, some casinos will allow a bet known as a fire bet to be placed. A fire bet is a bet for between 1-5 dollars in the hopes that the next shooter will have a hot streak of setting and getting many points of different values. As points are made by the shooter they will be marked on the craps layout with a fire symbol. The first three points will not pay out on the fire bet, but the fourth, fifth and sixth will pay out at increasing odds. The fourth point pays at 25-1 (a maximum of $125), the fifth point pays at 250-1 (a maximum of $1250) and the 6th point pays at 1000-1 (a maximum of $5000). Note that the points must all be different numbers for them to count towards the fire bet. A shooter who successfully hits a point of 10 twice will only garner credit for the first one on the fire bet. The shooter is required to make either a Pass Line bet or a Don't Pass bet if he wants to shoot. Line bets are based around points. Pass line: The fundamental bet in craps is the pass line bet, also called the win line in some countries. A pass line bet is won if the come-out roll is a 7 or 11. If the come-out roll is 2, 3 or 12, the bet loses. If instead the come-out roll establishes a point, and that point is rolled again, the bet wins. If a point is established and a 7 is rolled before the point is re-rolled, the bet loses. Don't pass: The opposite of the pass line bet is the don't pass bet. The don't pass bet is opposite in that it loses if the come-out roll is 7 or 11 and wins if the come-out roll is 2 or 3. 12 will draw, (this depends on the casino), either way a player cannot lose if 12 is rolled. A draw (the word "BAR", printed on the Craps layout,means "Standoff"), on 12 is done to ensure the casino maintains a house edge regardless of if players are betting pass or don't pass. If a point is established and that point is rolled again, the don't pass bet loses. If a 7 is rolled instead of the point being re-rolled, the don't pass bet wins. Many craps players consider don't pass bets to be in poor taste, or even taboo, because they are betting opposite to how the game is conventionally considered to play. Pass odds: If a 4, 5, 6, 8, 9, or 10 is thrown on the come-out roll (i.e., if a point is set), most casinos allow pass line bettors to take odds by placing from one to five times (and at some casinos, up to 100 times) the pass line bet behind the pass line. This additional bet wins if the point is rolled again before a 7 is rolled (the point is made) and pays at the true odds of 2-to-1 if 4 or 10 is the point, 3-to-2 if 5 or 9 is the point, and 6-to-5 if 6 or 8 is the point. Don't pass odds: If a player is playing don't pass instead of pass, they may also take odds by placing chips behind the don't pass line. If a 7 comes instead of the point coming, the odds pay at true odds of 1-to-2 if 4 or 10 is the point, 2-to-3 if 5 or 9 is the point, 5-to-6 if 6 or 8 is the point. For most players the perceived disadvantage of putting up the long side of the bet makes the don't pass odds less desirable, however putting up the long side reduces variance. Come bet: The rules for the come wagers are the same as for the pass line except that they can only be made after the come-out roll. If the roll the come bet is made on is a 7 or 11 it wins, if it is a 2, 3 or 12 it loses, just like a pass bet. If instead the roll is 4, 5, 6, 8, 9, 10 then the come bet will be moved by the base dealer onto a box representing that number. If the number is rolled again before a seven, the bet wins. If the seven comes before the number (the come-bet), the bet loses. Odds can also be placed on a come-bet just like a normal pass point; in this case the dealer (not the player) places the odds bet on top of the bet in the box,because of limited space, slightly offset to signify that it is an odds bet and not part of the original come bet. Because of the come bet, if the shooter makes their point, a player can find themselves in the situation where they have a come bet (possibly with odds on it) and the next roll is a come-out roll. In this situation odds bets on the come wagers are presumed to be not working for the come-out roll. That means that if the shooter rolls a 7 on the come-out roll, any players with active come bets waiting for a come-point lose their initial wager but will have their odds money returned to them, if the come-point is rolled the odds do not win but the come bet does and the odds are returned. The player can tell the dealer that they want their odds working, such that if the shooter rolls a number that matches the come point, the odds bet will win along with the come bet, and if a seven is rolled both lose. Don't come: There is also a don't come box which is the opposite of a come bet in that the player is betting that craps will come on the next roll instead of 7 or 11, or that if a come point is made, that value won't be rolled again before a 7. It pays just as don't pass and also has odds in the same way. 2 (snake eyes): Wins if shooter rolls a 2. 12 (box cars): Wins if shooter rolls a 12. Craps: Wins if the shooter rolls 2, 3 or 12. Any seven: Wins if the shooter rolls a 7. This bet is also nicknamed Big Red, since the 7 on its betting space on the layout is usually large and red. Field: This bet is a wager that one of the numbers 2, 3, 4, 9, 10, 11, or 12 will appear on the next roll of the dice. This bet typically pays more 2:1 or 3:1 if 2 or 12 is rolled, and 1:1 if 3, 4, 9, 10 or 11 is rolled. Unlike the other proposition bets which are handled by the dealers or stickman, the field bet is placed directly by the player. The Horn: This is a bet that involves betting on 1 unit each for 2, 3, 11 and 12 at the same time for the next roll. The bet is actually four separate bets, and pays off depending on which number is actually rolled, minus three units for the other three losing bets. Most players do a "Horn High" bet which involves betting an additional $1 on one of the 4 choices, with the most frequent being a $5 "horn high yo" bet (which means $2 on the 11, $1 each on 2, 3 & 12). These are bets that may not be settled on the first roll and may need any number of subsequent rolls before an outcome is determined. Hard way: You may bet that the shooter will throw a specific hard way (either 4, 6, 8 or 10), before he throws a seven or the corresponding easy way. A hard way is when both dice show identical values, so 2 2 is hard way 4. Easy way: Opposite of hard way is a bet that the shooter will throw a specific easy way (either 4, 6, 8 or 10), before he throws a seven. An easy way is an value that does not have two dice identical, so 3 1 is easy way 4. Big 6 and Big 8: These wagers are considered by craps players as sucker bets because they pay even money while a player can bet on the same proposition (that the number will be rolled before a 7) by making place/buy bets on the 6 or the 8, which pay more money. 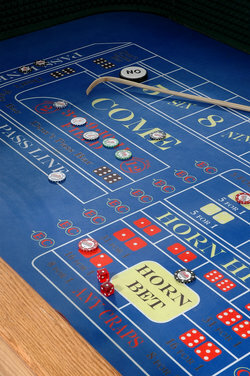 Veteran craps players avoid these bets, and some casinos do not even offer them. The bets are located in the corners behind the pass line, and bets are placed directly by players. Place and buy: Players can buy or place certain individual numbers (4, 5, 6, 8, 9, 10) by placing their wager in the come area and telling the dealer, "place the 6" or "buy the 8". Both place and buy bets are bets that the number bet on will be rolled before a 7 is rolled. Place bets are paid at odds worse than the true odds, while buy bets are paid at true odds, but a 5% commission is charged. Traditionally, the buy bet commission is paid no matter what, but in recent years a number of casinos have changed their policy to charge the commission only when the buy bet wins. Most casinos usually charge only $1 for a $25 green-chip bet (4% commission), or $2 for $50 (two green chips), reducing the house advantage a bit more. Where commission is charged only on wins, the commission is sometimes deducted from the winning payoff — a winning $25 buy bet on the 10 would pay $49, for instance. Lay: A lay bet is the opposite of a buy/place bet, where a player bets on a 7 to roll before the number that is laid. The lay bets pay true odds, but a 5% commission is charged. In some casinos the commission is only charged if the bet wins. Like the buy bet the commission is adjusted to suit the betting unit such that fraction of a dollar payouts are not needed. Note: Individual casinos may pay some of these bets at different odds than those listed below. The payoff odds listed are the most common throughout North American casinos. Note: Actual odds do not vary (and are yet to be added to the table). The expected value of all bets is negative, such that all players will always lose over the long run. This is because the house always sets the paid odds to below the actual odds. All bets have a negative expectation except for the "odds" bet that the player is allowed to make after a point is established on a pass/come don't pass/don't come bet (the odds portion of the bet has a long-term expected value of 0). However, the "free odds" bet cannot be made independently, so the expected value of the entire bet, including odds, is still negative. Since there is no correlation between die rolls, there is no possible long-term winning strategy in craps. It’s a common belief that maximizing the size of your odds bet in relation to your line bet will reduce, but never eliminate the house edge. The truth is that any amount of money piled behind your original bet as odds will not change the odds of the original line or come bet. It would be more correct to say that by placing more than single odds behind your original bet, you are grossly overpaying for the chance to win. Many casinos have a limit on how large the odds bet can be in relation to the flat bet, with single, double, and five times odds common. Some casinos offer 3-4-5 odds, referring to the maximum multiple of the line bet a player can place in odds for the points of 4 and 10, 5 and 9, and 6 and 8, respectively. During promotional periods, a casino may even offer 100x odds bets. Although such large odds offers look attractive, they can be summed up as advertising strategies designed to attract more gamblers. Except for the occasional win by a lucky player, the offer of any multiple odds accomplishes its goal of getting more money on the table and bigger profits for the casino. Since all bets have a house advantage (and a negative expected value) the optimal strategy is not to bet. Players can, however, reduce their average hourly losses by only placing bets with the smallest house advantage. The pass/don't line, come/don't line, place 6, place 8, buy 4 and buy 10 (only under the unusual casino rules where commission is charged only on wins) are the bets with the lowest house edge, and all other bets will on average lose money between three and twelve times faster because of the difference in house edges. This runs counter to the notion that hardways and C/E on come-out roll are necessarily bad bets, since, although their house percentages are poor, they have lower minimum bets and happen less frequently. Therefore, they do not lose money as quickly as the pass line bet. Also, by this metric, other betting patterns are shown to be costly, for example placing $10 on all point numbers, which has a much higher loss of $40.49 per hour or $810 per trip. Players are not supposed to handle the dice with more than one hand (such as passing them from hand to hand before rolling) nor take the dice past the edge of the table. The only way to change hands when throwing dice, if permitted at all, is to set the dice on the table, let go, then take them with the other hand. When throwing the dice, the player is expected to hit the farthest wall at the opposite end of the table. The dice may not be slid across the table and must be tossed. Typically, players are asked not to throw the dice higher than the eye level of the dealers. The dice cannot land in the boxman's bank or on any of the dealers' working stacks of money. In most cases the shooter may "set" the dice to a particular configuration, but if they do, they are often asked to be quick about it so as not to delay the game. Some casinos have "no setting" rules. Do not try to place money in the dealer's hand or expect the dealers to hand you chips. Dealers are not allowed to touch the players. A player is expected to lay the cash down on the layout, which the dealer will take and then place chips in front of the player. Many craps table layouts state "NO CALL BETS". This means a player is not allowed to call out a bet without having at least the right amount of chips on the table. If the chips exceed the bet, for example a $100 chip is placed and bets called out of "$25 on five and nine", the dealer will say "it's a bet" and return $50 change to the player. The dealer doesn't have to actually place the bet in the proper place on the table to constitute a valid bet. This method is consistent with the fast action of the game, allowing a player to make a last-second bet while the dice are about to be thrown. The NO CALL BET rule may exist to prevent confusion on the amount bet, possibly going back to the days of 25 cent tables. For example "three fifty" could mean $3.50 or $350. If the dealer is not clear about the intention of the player he may state "no bet" and push the chips back to the player. The casino can ask you to leave for ANY reason. When tipping, the most common way is simply to toss chips onto the table and say "For the house," "For the dealers," or "For the boys" (the latter is considered acceptable even though dealers often are women). Another method is to place a bet next to your bet and call out "dealers." A "two-way" bet is one that is part for the player and part for the dealers. Usually, the dealers' bet is smaller than the player's bet, but it is appreciated. The part of the bet for the dealer is called a "toke" bet; this is from the $1 slot machine coins or tokens that are sometimes used to place bets for the dealers in a casino. Most casinos require the dealers to pick up their winning bets, including the original tip, rather than "let it ride" as the player may choose to do. It is considered rude to "late bet," or make wagers while the dice are no longer in the middle of the table. While entirely permissible, excessive late betting will generally garner a warning. Players feel it is bad luck for the shooter to leave the table after a successful come-out roll. While it is mathematically a slightly better bet, "wrong bettors" (people who bet "don't pass") are considered to bring bad luck to the table. When making bets in the field or on the Big 6 or Big 8, it is the player's responsibility to track his or her bet. Place bets and Come Line bets will be tracked by the dealer, who will pay you directly. Hardway and other proposition bets are tracked by the stickman and will be paid by the dealer to you directly based on instructions from the stickman.